There is much more to the 3D social network Second Life than fun and games. You can network with writers, poets, actors, musicians, and artists at places like Quills (pictured here). You can visit foreign countries and learn new languages by speaking to those with a true native tongue. You can attend live concerts, workshops, readings, and plays. You can even join role playing games and become a vampire, werewolf, mage, or Hogwarts student. But what if you’re just looking for some fun wind-down time? Well, they have that too. 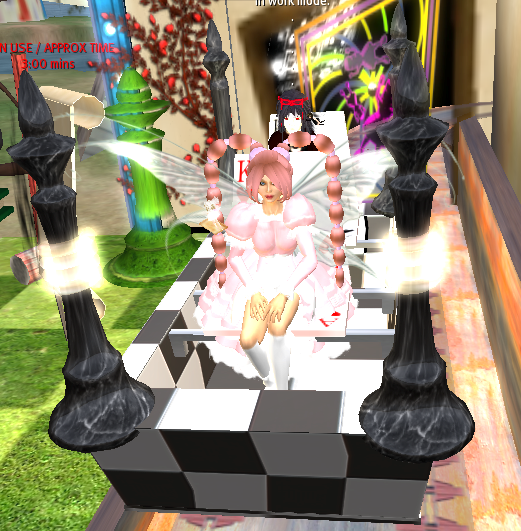 Recently I’ve been checking out the amusement park rides on Second Life. Yes, you heard me. If you haven’t got the time or money to pop over to Disneyland in real life, you can spend a few hours at these wonderful builds on Second Life. Every bit as realistic and awesome as the real rides, without the waiting in line! 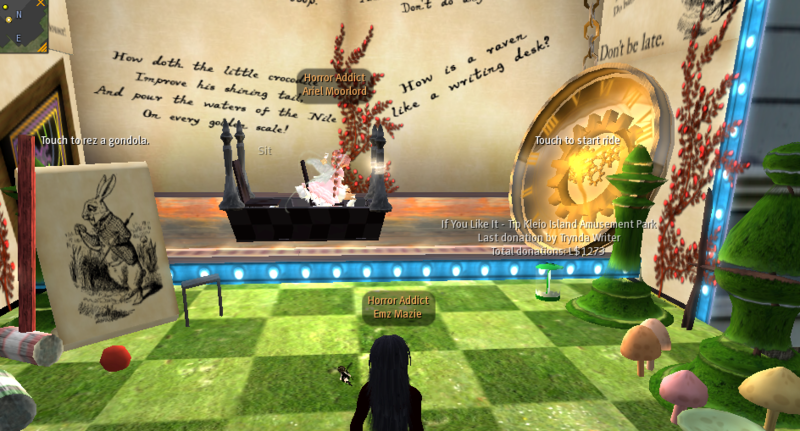 My favorite ride so far is the Alice in Wonderland ride at Kleio Island Amusement Park. According to the signs posted in front of the ride, this massive dark ride took six months to develop. These screen shots show you just some of the great artwork and structure building this project encompasses. Add to this the sound clips and environmental perks and you have an excellent experience that you can ride any day of the week for as many times as you like with no waiting! The ride gondola is very cute and set to theme. It starts out as a black and white checked car and changes colors as you ride. The seats are made of playing cards and the four corners of the vehicle are capped in chess pieces. All this gets you in the mood to take a ride into Lewis Carroll’s fantasy. First the ride takes you through the Mad Hatter’s tea party. Then you get to ride by the Queen of Hearts and her King. The high build shows you a view of the entire amusement park as it brings you through the Jabberwocky section. Then you spiral down through the black and white tunnel into the end of the ride, where you can ride it all again. Kleio Amusement Park offers all sorts of carnival rides such as a ferris wheel, jumbo slide, and this merry-go-round where you can ride crystal horses through the snow. Rides and extras on this land such as cotton candy and tea party venues, are mostly free. Some cost a minimal amount, but you can choose to buy or go on to the next event. The Alice ride is free, but if you’d like to leave a donation to those excellent creators of this fun ride, they have a tip cup near the entrance.